Well I've decided to adjust the development priorities for CommunityWalk today. For a while now I have been receiving requests for the ability to print CommunityWalk maps with increasing regularity. I had already prioritized it for an upcoming release, but it has become painfully obvious that people want it yesterday, not in a month. So I have made it a top priority and will be releasing it with the next release. Stay tuned on this blog for the release announcement sometime in the next week or two. Keep the feedback coming in. It really helps me prioritize the long list of enhancements we have for CommunityWalk. CommunityWalk's march towards a more professional look continues with a new About section. Based on the designs that Ideacodes did for the front page I whipped up this section, providing information about the current and future state of affairs for CommunityWalk as well as providing due credit to Ideacodes and Pivotal Computer Systems for their excellent work. Show and Hide Locations With Ease! I just released a little feature that I think will have a big impact. Basically it allows you to show and hide categories of locations directly from the legend. So you can easily filter a large map down to the one or two categories you are interested in. It works on the small blog version of maps as well! Just click the "Legend" button in the top right corner and then click a category. Check it out on the great map of Pioneer Square Lunch Spots up in Seattle! Play around with it a bit, it makes the maps so much more interactive! If you haven't seen it yet you should check out this great map of Philadelphia Restaurants created by the writers of the fiftyone:fiftyone blog. It details all the restaurants participating in Philly Winter Restaurant Week, with menus for each restaurant, categorized to show the type of restaurant. It's really an impressive map that I think would be very handy to have if I lived in Philadelphia! We've already found and fixed a few bugs that we introduced with the latest release. If you find any please let us know and we will get them fixed immediately. 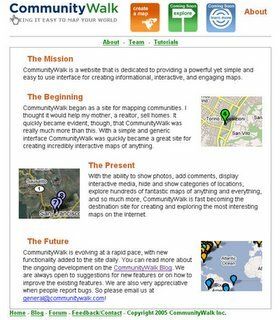 I just pushed out a large infrastructural release to CommunityWalk. This one has fewer visible changes, but it has a lot of changes under the hood. There were a few tweaks to the map page (including adding the reset button, making the logo more prominent, and changing "What", and "Where" to "Legend" and "Map Overview. There were also some changes to better fascilitate future commercial versions of the map, but, in general, most of the changes will not be visible. Hopefully, though, you will find a better performing site. If you find any bugs or have any feedback please let me know. This was a huge restructuring effort so it is definitely possible that we broke something along the way.